Thank you all for hanging in there during this series. Sorry for not writing in a while but I have been distracted for the past few months. We are very close to the conclusion of this series. 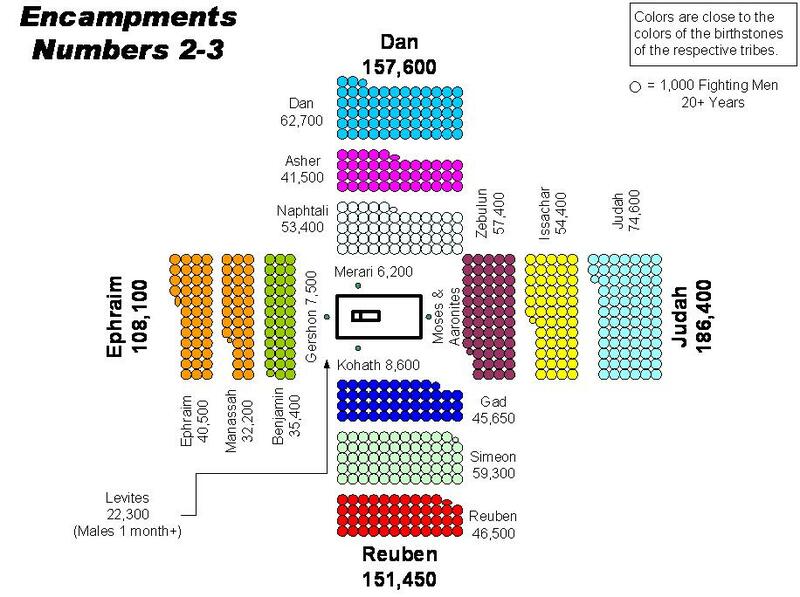 Though there are 12 tribes/sons of Israel, for the encampment there are actually 13 tribes because Joseph’s lot was split between his first two sons Ephraim and Manassah. The twelfth tribe we will be discussing is that of Naphtali. Genesis 30:8 – Then Rachel said, “With great wrestlings I have wrestled with my sister, and indeed I have prevailed.” So she called his name Naphtali. In studying the word “Naphtali”, I found the root of this word is “pathal”. The word “pathal” means to twist, to be twisted, to wrestle, to twine, to spin, or to struggle (among a few other definitions). My mind often works in words meaning if I see a specific word I immediately think of places where that word has meant the most. When I see the word ‘wrestle’ I immediately think of the story of how Jacob wrestled in the night with the Angel of the Lord until he was blessed and through that struggle his name was changed from Jacob meaning ‘layer of snares’ (deceiver) to Israel meaning ‘God prevails’, ‘contender’, and ‘soldier of God'(Genesis 32:22-28). Let’s be honest, Rachel was a bit jealous because her sister, Leah, was having children and she was not. Because of this she came up with a plan to give Jacob children through her maid. It was a struggle for her because she was not able to have kids on her own. This plan was not counted against her. Whatever the original design was, this plan was used to bring about God’s plan. Now I am not suggesting that we take matters of our lives into our own hands. What I am saying is God sees more of us than what others see; He sees what is within our hearts (1 Samuel 16:7) and His plans never fail. I do not recommend wrestling with God in the sense of testing Him. I do recommend being completely honest with Him about how you feel at any given moment. I believe that Jacob was able to wrestle with the Angel of the Lord because of the pure intent within His heart that he may not have even realized at the time. I also believe that if ever and whenever we come to that place in our lives, God answers that call that is coming from our hearts through the blood of Jesus and through the Holy Spirit to break us and to kill that part of our flesh that we have not yet let go of. God never changes. His words, His plans, and His love never (NEVER) fail. It is us who need to change. God doesn’t cause the negatives in our lives but He can, does, and will use them to help us surrender every part of ourselves to Him to fulfill the purposes He placed inside of each and every one of us. This is why I believe Naphtali is the last of the tribes as far as the encampment placement. As far as this series is concerned, our “wrestling” that we endure brings us to the end of ourselves which allows the God-Head to work within and through us to bring the purposes of the Heavenly Kingdom to earth. It is when we have fully surrendered, that the fullness of Jesus the King, the Annointed One, can be the Head of our lives. When we come to the end of ourselves (which is an on-going process through every season we have), we can hear the Lord’s voice better, we can see the Kingdom better, and we can be even more obedient to His call than before.